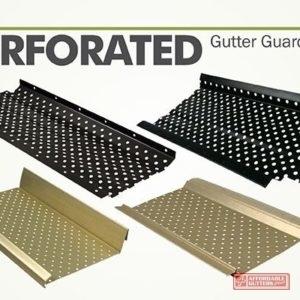 We Have Several Guard Gutters For You To Choose From, Including the Standard. As anyone who owns a home knows, cleaning the gutters can sometimes feel like an onerous chore. 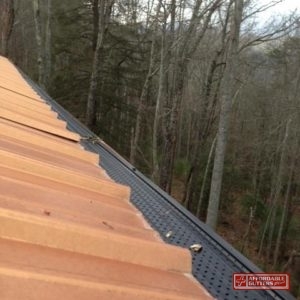 Leaf guard gutters from Affordable Gutters Plus exist to save homeowners in Canton and Roswell, GA and surrounding areas the trouble of this ordeal. Gutters are designed to protect our homes from the dangers of rainfall and work to siphon water away from the home. As gutters get clogged with debris, they fail to function properly. A clogged gutter not only ceases to serve its purpose — it can outright damage your home. As water fails to siphon, it can back up and overflow from the edges of gutters. This can create water damage along the sides of your home, and damage the foundation as water collects near the house. To help support an effective gutter system, more homeowners have begun to invest in leaf guard gutters in Canton and Roswell, GA. These wire, mesh, aluminum, or vinyl guards get installed directly over the troughs in gutters. They then function to prevent debris and leaves from entering the gutters. Rainwater cascades down the angle of these guards, or through them, to enter into the trough naturally. From there, the rainwater follows the normal flow out the downspouts, uninterrupted from the intrusion of debris. With gutter guards, gutters function more efficiently and effectively. Damage from clogged gutters gets prevented, and homeowners are spared the task of regular cleaning. Though you still need to occasionally have your gutters cleaned, you can trust that gutter guards make this an infrequent project. Though leaf guard gutters represent an additional cost over the cost of gutter installation, homeowners will undoubtedly value the investment. 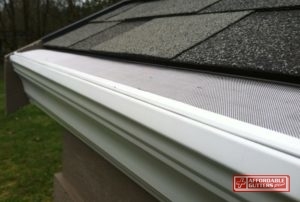 Affordable Gutters Plus installs many varieties of leaf guard gutters in Canton and Roswell, GA. Regardless of which you choose, you can count on a dependable product that matches the expertise of our installation and service. 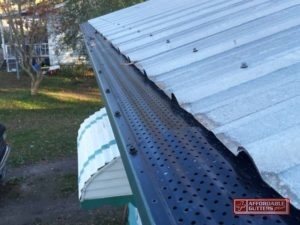 Eave and Flow: These perforated gutter guards get installed over the gutter trough to keep out large debris and leaves. Eave and Flow guards do not impede the natural flow of water, as the perforations allow it to enter freely. 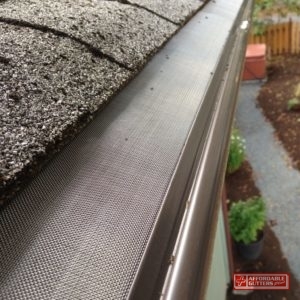 Mesh guard: Mesh guard gutter guards get installed at a vertical slant, which draws the rainwater across the surface to disperse within the gutters. The mesh construction allows water to enter, but keeps even small solid particles from clogging your gutter system. With mesh guard gutters, even shingle stones get filtered from the water that enters your gutters. Flat Black Screen: This variety of gutter guard gets forged from heavy gauge steel. The unique crimped edge locks directly onto the lip of the gutter to make installation a breeze. A black, powder-coated finish blends well with most roofs, and the mesh construction filters out everything but the smallest debris. 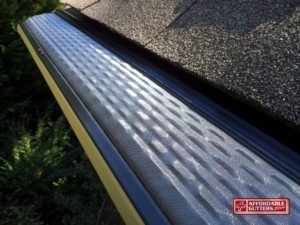 The hardy construction of this gutter guard allows the mesh to function properly season and season. Leafree: This system works according to the principle of water adhesion. As water hits the surface of the Leafree gutter guard, it flows down into a ½ inch horizontal opening. The patent-pending construction of Leafree guards allows water to enter the gutter, while keeping all leaves and debris out. The system can handle even the heaviest rainfall, while the low profile design beautifies the exterior of the home. Leaf gutter guards bring four major benefits to your home. As you weigh the cost of investment in gutter guards, consider each of these factors alongside the long-term savings to maintenance costs. No Clogged Gutters: One you install a gutter guard system, you are much less likely to have clogged gutters. Leaves and large debris can land in gutters and leave them clogged. This creates a number of problems for your home, including mold and mildew, and flooded basements. As water overflows from clogged gutters, it collects around the foundation of your home. If you have a basement, this water has a flood potential in addition to the damage it does to your home. Also, keep in mind that moisture rises. As water collects around the foundation of your house, you can have mold and mildew problems anywhere from the basement to attic. Clogged gutters also create static pools of water around the roof of your home. These pools can attract pests, and serve as breeding grounds for many types of insects. In particular, the standing pools from clogged gutters can create a high breeding potential for mosquitoes. You can prevent this with gutter guards in Canton and Roswell, GA from Affordable Gutters Plus. Less Gutter Maintenance: Normally, a homeowner must have his or her gutters cleaned at least twice a year. Leaf gutter guards save you this annual spring/fall ritual, as they reduce dramatically the frequency of cleaning. When you do need to get your gutters cleaned, this process becomes much easier. If you use a service like Affordable Gutters Plus, this project requires fewer man-hours, and thus a reduced cost. If you clean your own gutters, you spare yourself the frequent danger of work atop a high ladder. 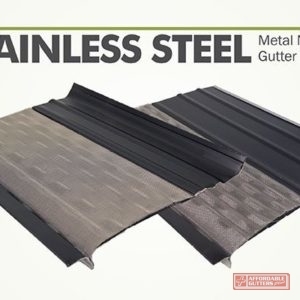 Less Rust: Gutter guards can drastically extend the life of gutters prone to rust. As wet, clogged debris rests within a gutter trough, the gutter can rust much more quickly than normal. Rusted gutters can quickly become damaged, non-functional gutters, prone to leaks. In this regard, gutter guards serve as protection on your initial investment into a seamless gutter system. Protection from the Elements: In the event of cold weather, water can collect and freeze within clogged gutters. These creates a more pronounced clog, which can result in gutter overflow and water drainage into the home. Clogged gutters can also create a fire hazard. As leaves and debris collect and dry, they effectively create a ring of tinder around the roof of your home. To learn more about the particulars of leaf gutter guards, do not hesitate to contact Affordable Gutters Plus at 770-735-4433. We exist to serve the homeowners of north Georgia. 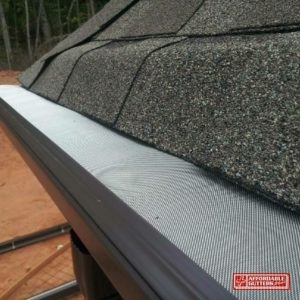 If you need installation leaf guard gutter systems in Canton and Roswell, GA or surrounding areas, let us protect your investment in gutters. 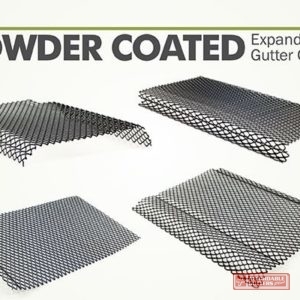 Updated on September 20, 2018 at 6:38 pm by Affordable Gutters Plus LLC.